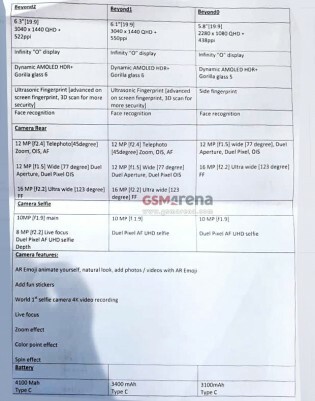 We reported on some of the details found in the sheets, like the new 10MP f/1.9 selfie camera that can capture 4K video. It will have dual-pixel AF but the sheets don't mention optical stabilization, which was reported as a new feature. We've also heard of the new super slow-mo capabilities of the Galaxy S10 trio - they'll be able to capture 0.4s-0.8s of video, twice as long as their predecessors. Mostly the specs are a rehash of what's been rumored for awhile now but there are some interesting bits, like the promised 800 nits of screen brightness - so far we've not tested a Galaxy flagship with more than 700 nits in our office. Another deviation from what we've seen rumored is the screen size of the Galaxy S10+. 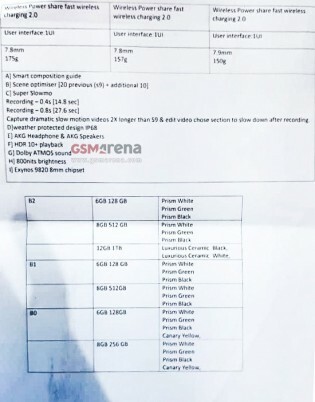 The insider specs sheet claims a 6.3-inch diagonal of 3040x1440px resolution, whereas rumors say a 6.4-inch display. 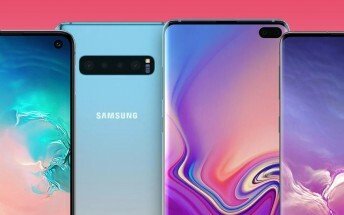 Then there are the cameras - the Galaxy S10+ and Galaxy S10 have triple rear cameras (12 f/2.4 45-degree tele / 12MP f/1.5 77-degree regular / 16MP f/2.2 fixed-focus 123-degree ultra-wide) while the Galaxy S10e is listed as having a regular and an ultra-wide camera, while rumors suggested it will stick with the regular + tele configuration of the Galaxy S9+. Hat tip to our anonymous friend!